Oil on board, 6" x 7 1/8"
A painting within a painting. While casting about for a subject, I noticed the glowing light filtering across a studio wall, where I had recently hung one of my large shell paintings. This is a very fun painting. The shell is enhanced by the interior. Hopper 'nd Wyeth-Marriage you did; great painting I see... Painter's Solitude! Nice old-fashioned door. I love architecture. Thanks, Kristen. The studio is in a beautiful old building--many terrific doors like this. It took some patience rendering this Don! You did a great job. I love how real that seashell painting looks. Wow. How cool is that?! Some people copy old masters in museums, and you copied a master in your studio. I did not say you're an old master. This is a great painting! It's like Rosencrantz and Guilderstern are Dead... a play within a play. I love all the different shades of white in it. So real, I would swear I was in the studio now. Seriously, this is a beautiful painting. If you come to town for 1st. Friday I hope to see you. Thanks, Kristin. I would never have thought of the Rosencrantz and Guilderstern analogy--but I'm glad you did. Thanks, Bri. We might make first Friday--if not will hope to see you soon. I love the way this painting plays with perception. 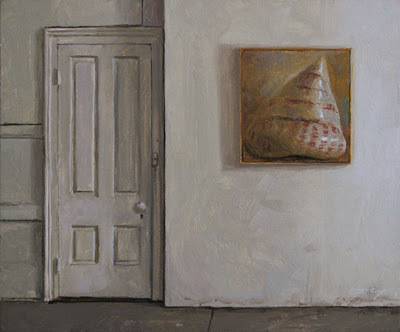 The apparently huge shell makes the room and door seem like those in a model, yet at the same time I'm aware that it's actually a painting of a normal sized room with a painting of an oversized shell. Of course, it's all just a painting anyway, and a very small one at that. Oh my head. Fantastic, Harry--I love how you put it! And you made me see my own painting in a different way...many thanks! Love this one Don - shows off your range of painting styles. I enjoy 'em all - best to you on Labor Day! Bill, I sure appreciate it--I'm always amazed at your stylistic range. Hope you're having a great Labor Day too. Don,it's strange.It almost couldn't work- but it does work. For me it is Dorothea Tanning. I can't imagine the connection to Dorthea Tanning, Sheila, but I'm deeply flattered--she's a fabulous painter. Nice to hear from you--welcome back from Ethiopia. Nice painting! Thank goodness some kids are still taught to hunt. Many children now have no idea how to hunt, survive and take responsibility for getting their own meat.